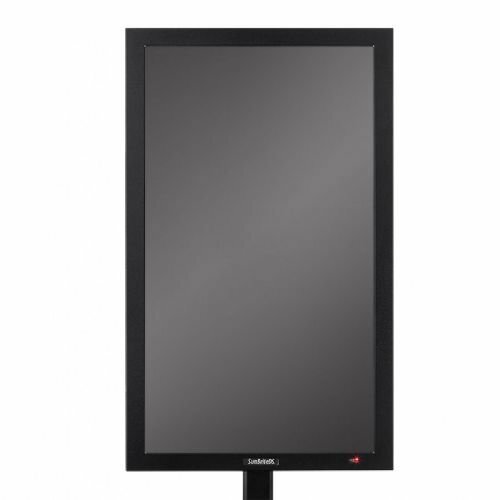 NEW SunBriteDS - outdoor digital signage - 47" weatherproof LED-LCD digital signage display in hard-to-find portrait-mode. The commercial-grade Pro Series DS-4717P includes Enhanced Solar Tolerance (EST) technology to prevent isotropic blackout - engineered for direct sun applications. This 47" outdoor AV power-house features a powder-coated aluminum exterior - to defend against harsh weather and a multi-fan airflow system keeping the unit cool & dry in temperatures up to 122 degrees F and down to -40 degrees F. Complete with full-HD 1080p, anti-reflective glass to shield the LCD-LED screen ... and a two-year parts & labor warranty. The DS-4717P does not include its optional speaker bar. If sound is needed with this model, please purchase the SB-SP47P - in silver or black.